Dominate This, a 3-year-old colt by multiple stakes sire DOMINYUN, finished second in the 63,364 Rocky Mountain Derby at Arapahoe Park Saturday. WAYNE, OK�JUNE 17, 2018�In other Royal Vista Stallions News over the weekend Dominate This, a 3-year-old son of multiple stakes sire DOMINYUN, finished second in the $63,364 Rocky Mountain Derby at Arapahoe Park. 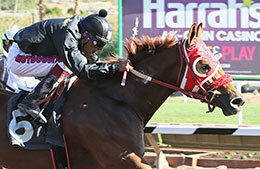 Angel Hernandez-Villalobos owns the sorrel gelding out of Valiant Red Vixen by Valiant Hero. Lorenzo Compuzanno trains with Mark Jasso getting the riding call. He earned $12,673 to bring his earnings to $78,874. Brenda Reiswig bred Dominate This is Oklahoma. Wonderland, a 2-year-old filly by leading sire IVORY JAMES, posted the 4th fastest qualifying time for the $20,000 Guaranteed Mystic Lake Northlands Juvenile at Canterbury Park. Tim Holdaway is the owner-breeder and Marcus Swiontek was riding. Bobby D. Cox bred Wonderland in Oklahoma from the First Down Dash mare Shes Dashin First. The finals will be contested on July 8. In Broodmare Sire news IVORY JAMES was represented by One Two, a One Sweet Jess filly who finished second in the $59,200 Rocky Mountain Futurity at Arapahoe Park. Margarito Montalvo is the owner, Jose Villafranco trains and Cerapio Figueroa was riding. Bill and Marsha Drake bred the brown filly in Colorado from the IVORY JAMES mare Im Haley Two. She earned $11,840 for the effort. IVORY JAMES is also the broodmare sire of Sunlight Seven, a Valiant Hero filly who posted the fastest time in the aforementioned $20,000 Mystic Lake Northlands Juvenile at Canterbury Park. An Oklahoma home-bred racing for Brenda Reiswig, Sunlight Seven is out of Midnight Sunlight. Victor Hanson trains and Brayan Velazquez had the riding call.